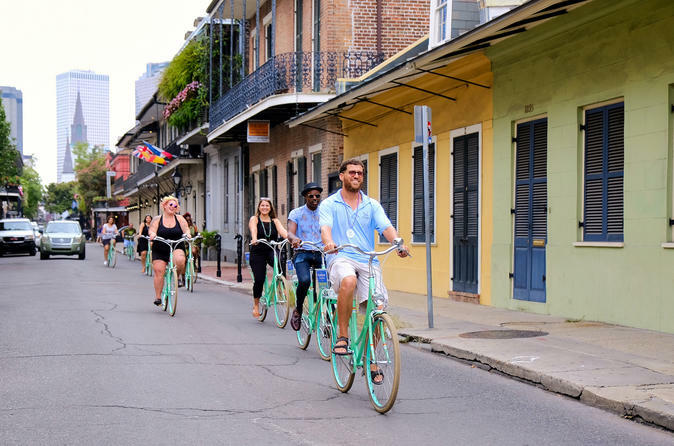 Join us on this guided tour through the most unique city in America, New Orleans, in the best possible way to explore it...on a bicycle. Heart of the City is a 3 hour exploration of the historic neighborhoods of New Orleans. The trek will shed light on New Orleans' traditions and heritage. As you are guided through the town, you will learn about the city's colorful past and vibrant culture as you are taken on an exploration of the historic core of the city. Starting in the French Quarter, you will make several stops to learn about the early development of the city in 1718. you will then journey beyond the Quarter to the city's three most historic neighborhoods (Faubourg Marigny, Faubourg Treme, and Faubourg St. Marie). This tour also pays close attention to the development of jazz and the colorful innovators who created it. The cycling route will follow the excitement of this developing new music, while also tracing the early life of Louis Armstrong.